Our Cato personal injury lawyers serve clients throughout New York State, including in Cato. Cato, a town in Cayuga County, New York, located northwest of Syracuse, New York, has a population of about 3,000. The name was given to it by the surveyors of the Military Tract, and has a classical origin, as do many of the towns and villages in this area. The Town of Cato contains a part of the village of Cato and also contains the entire village of Meridian. Many of Cato's residents have selected the Central New York injury attorneys at Michaels & Smolak as their attorneys because: (1) they have a top reputation in the area; (2) they have a convenient office in nearby Auburn, NY; and (3) they will travel to Cato to meet their clients. Recent clients from Cato include a man who sustained neck and back injuries after being struck by another vehicle while driving a garbage truck, and another man who was struck by a vehicle that had crossed into his lane of traffic after being struck from behind by another driver. Our personal injury attorneys serving Cato residents handle all kinds of personal injury cases. To name only a few, we handle motor vehicle accidents, whether involving a car, bus, motorcycle or bicycle, as well as burn and explosion cases, construction accidents, workplace accidents, dog bite cases, boating mishaps and school negligence cases. All of such cases are taken on a contingency fee basis, meaning that we only earn a fee if we get a settlement or verdict in our injured client's favor. Although different types of personal injury cases require different elements of proof, generally they all require that you prove: (1) that the defendant had a duty to you; (2) that the defendant breached that duty to you; and (3) that as a result of that breach of duty, you suffered some kind of harm. For example, in a car accident case, the at-fault driver had (1) a duty to follow the rules of the road; (2) breached that duty by running the stop sign, and (3) caused you harm by injuring your neck. The first two elements (duty and breach of duty) are referred to together as "negligence". So really you have to prove the defendant's negligence caused you harm. What kind of harm? When you prove the defendant was negligent and caused you harm, the damages you can recover include both economic (lost income, medical expenses, etc.) and "non-economic (pain and suffering) damages. The "pain and suffering" includes the mental suffering that comes from your failure to be as engaged in things you enjoyed doing as you did before the accident. For example, if you loved gardening but can't do that anymore, you should get compensated for that "loss". At Michaels & Smolak, we not only want to represent our clients, we want to keep them well informed. 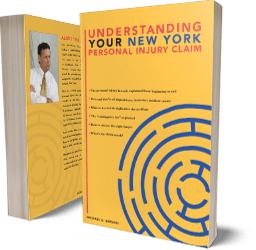 That's why one of our lawyers, Mike Bersani, has published a book called "Understanding Your New York Personal Injury Claim", which we give out for FREE online, and which we hand to each new client as we sign them up. The book takes the client through the claim process from beginning to end in a clear easy to understand format. Many of our clients, including our Cato clients, have found this book, as well as our blog and extensive website, very informative and useful. Our Cato personal injury lawyers believe the best client is an informed client. Most of the cases the Michaels & Smolak personal injury lawyers take in from Cato are referred to the firm by other Cayuga County lawyers. Those other lawyers recognize the firms outstanding reputation in the field of personal injury and medical malpractice law. The firm is, in fact, the only one in all of Cayuga County that limits its practice almost exclusively to personal injury and medical malpractice cases. Michaels & Smolak, though based in Auburn, is a regional Central New York firm with satellite offices in Liverpool, Geneva and Syracuse. If you are a Cato resident and need a personal injury lawyer, don't hesitate to contact us in our Auburn, New York office. We will be happy to meet you either in Cato or at our Auburn office. The consultation is absolutely free. Directions to the Auburn law offices of Michaels & Smolak from Cato can be found HERE.